Lost Your Apple TV Remote? You Don’t Need to Buy Another! Here is another handy tip for all Apple TV owners. Apple TV has proven to be a very useful gadget, both at home and at school. Airplay mirroring is its best feature. I am able to show whatever is on my iPad/iPhone screen and beam it up to a big-screen TV or a projector. I believe, at its relatively low price point of $100, any Apple fan should own one. In terms of the classroom, it can be a powerful tool for supporting your teaching. Teachers can benefit from being able to roam around the classroom and beam up multiple devices. One minor issue: The small remote is so easy to lose! If you have lost or misplaced your little Apple TV remote, there is no need to buy another one (They cost about $20, 1/5th the price of the Apple TV itself!). 1) Your iOS device using the Remote App. The perfect replacement for your Apple TV remote is your iPhone, iPod touch or even your iPad using the Apple’s Remote app. The remote app (free) just needs to be hooked up to the same Wi-Fi network as your Apple TV and it works quite well. It relies on gestures to control your Apple TV. Although it does take a little while to get used to the gestures, after a while it becomes quite intuitive. Rewinding and fast-forward just requires swipes to the left and right respectively. The “Enter button” is just a tap anywhere on the main portion of the screen. Even if you haven’t lost your remote, some of you might even prefer using the device that is always with you anyways. This will also reduce the need for just an extra remote lying around. Is your AppleTV not connected to your wifi network? If so, this will be a problem if you want to just use the tip above. Unfortunately, you will not be able to connect the Remote app to it, because Home Sharing on the Apple TV will not have been set up. 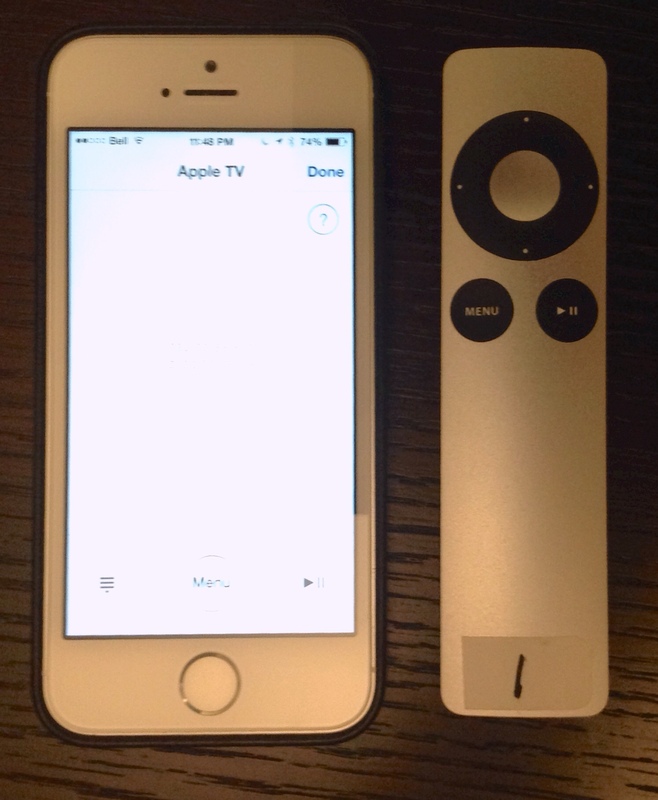 A quick solution is to borrow another Apple TV remote to control yours and you don’t have to change any settings. It will work right away, so if you need to get on the same network as your device use a friends remote just for the time being. After setting up Home Sharing, you will be able to use the Remote app. 2. Use any other, old remote control lying around. The Apple TV only needs six buttons, program any six buttons on your old remote. As you can see from this photo, I am actually preferring using the DVD player remote, instead of my iPhone, to control my Apple TV. Pressing any the buttons I programmed does not power on my DVD player, as I avoided using the “Power button” as one of my six choices. There you have it! You now have a few options for replacement or even additional remotes for your Apple TV. Have you ever lost or misplaced your Apple TV remote? Hope this helps! Like this post? Please share! I reset my Apple TV and was able to use the 1keyboard app for Mac to set up and control my device. You can use a bluetooth keyboard as a remote as well. This worked perfectly!! Thanks for the help, I was about to throw my Apple TV away! 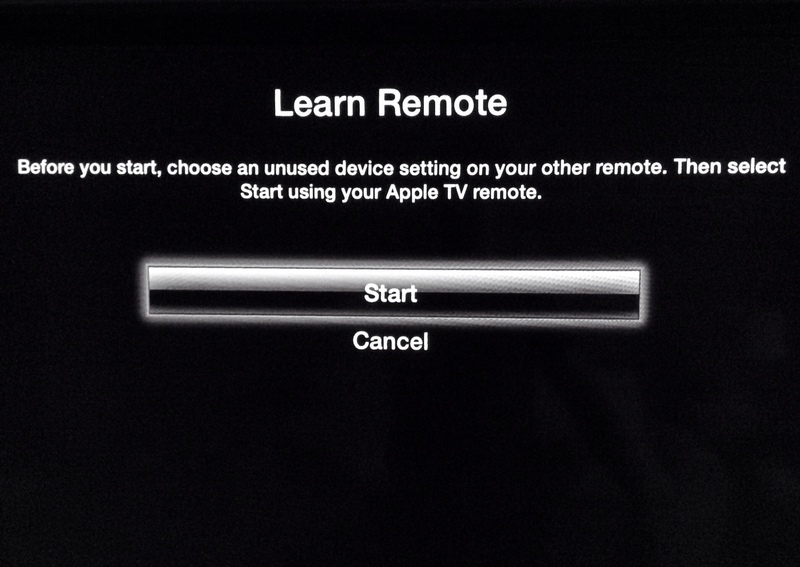 How exactly are you suppose to use the free remote app if you can’t turn on you Apple TV to begin with. The app makes you input a pass code in order for your phone/iPad whatever is recognized as a remote. I can’t find my little remote to turn Apple TV on and I most certainly can’t setup the app. What do you do from there? Try airplaying something from your iPad, or iPad. Even if my AppleTV is off, if I airplay a video, the AppleTV will turn on. You can turn on Apple TV by simply unplugging it and then plugging it back in. this was great! 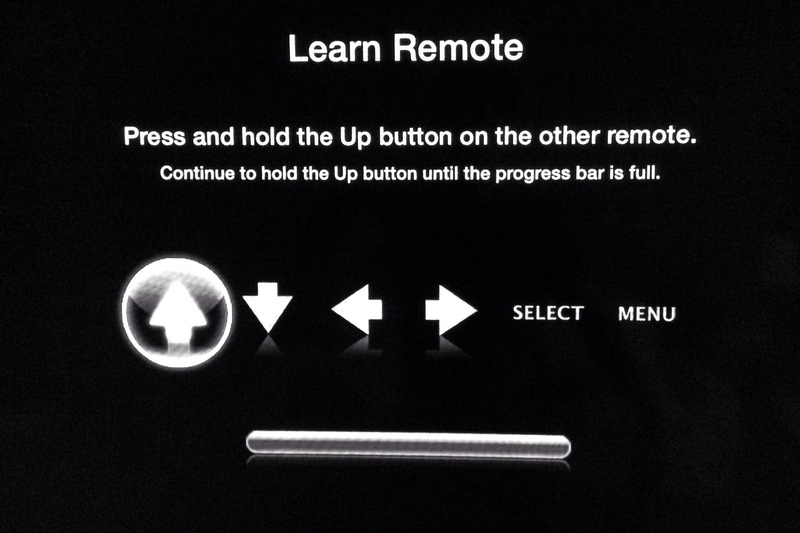 thanks so much, I followed the steps and fixed the remote issue. Luckily, i had the extra ethernet cable and a universal remote that worked! Glad to hear! I still haven’t found my apple remote haha! Haha. I think like most, I came here looking for my lost Apple TV remote. And, thanks to your blog post, I found it! Great job SEO wise, haha. Great article Stephen. For those who live outside US like me, you can access Netflix, Hulu and similar media stations on your Apple TV by using UnoTelly or similar tools. Thanks for letting us know Audrey! So, my mom decided to bring her Apple TV over to my place, but COMPLETELY forgot about the remote. I haven’t tried this out yet, just about to, but until she comes back again in about half a year, she won’t be bringing the remote over. And even then, it’s doubtful that she’ll remember… I hope this works for me!! Hoping this will work for me! My remote has been missing for 2 months. Looking forward to using the Apple TV again. Thank you!! Excellent article! Bravo, car tout ce que vous avez écrit est exact et fonctionne à merveille. Continuer votre excellent travail et merci encore! I am so glad I stumbled upon your site. I keep losing my remote. It’s so tiny! I hope I win one of the ones you are giving away! Thanks for the opportunity! Ah, if I win the Apple TV Remote, I’ll be sure to use it to set up the Apple TV on the new network and use your solution. Thanks! Very cool site, and I did use google to get here. I’ve been looking for that remote all week, and I cannot find it. I’m glad I found this, and I’ll happily follow for more info. Would love a chance to win a remote, Steve! Thanks for the post! Found this on google and followed you! Thanks so much for the chance to win another remote. My son must have lost it about 5 months ago and I haven’t been able to watch anything! Hope it’s not too late! OK, here is my problem. After loosing the remote we changed internet providers. So, the WiFi connection that Apple TV knows doesn’t match our new WiFi connection. So everything that should be popping up on my phone in order to program it and use it, isn’t working. So what do we do? I have troubleshooted everything I know to do and keep getting the same error message “remote cant connect to your iTunes library” Please help!! 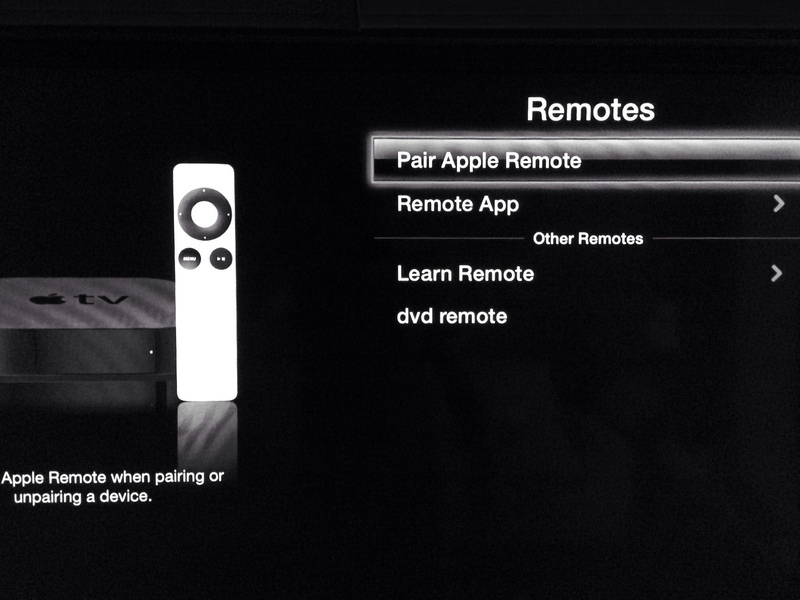 Hey there… I tried this fix, but my Apple TV did not have HomeSharing enabled before I lost the remote. I downloaded the app and plugged the cable into my modem and Apple TV, but the ATV does not appear on the app as the video suggests it will. Do you know of a fix for this? Looks like you’ve tried your best. 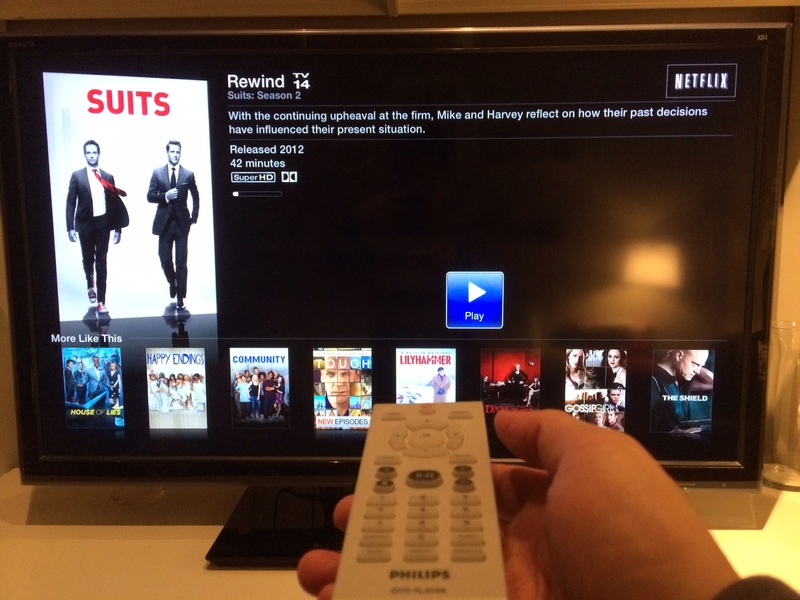 Is it possible to borrow a friend’s remote and set up home sharing real quick? Not that I know of… Very tempted to just buy a new remote. Will any Apple TV remote work? Yes. No need for setup. It will work right away. Look up “Remote” in the app store. Its the official Apple one. I got so tired of my kids losing my Apple TV remote I created a way to find the remote in seconds! I physically attached a Tile blue tooth tracker to the Apple TV remote. The Tile connects with my mobile devices via blue tooth. When the remote is misplaced I activate the Tile with my phone or iPad and it plays a pleasant melody. I am led directly to the remote and always find it in seconds, even if it is in a different room. I liked my modification so much I decided to share it with everyone. That’s a great solution! thanks! I am wildly useless with technology but this worked easily. Thanks! We have 3 apple TVs in the house and I’ve lost my remote. Neither of the other two remotes will control my Apple TV. I have tried plugging in to Ethernet but the remote app does not pick up my TV it’s just says I need to enable home sharing…shame none of these work! I lost my controller to my apple tv that said I had recently changed my apple I’d password. I downloaded the apple remote app however it would not work . It kept saying my account I’d or password was wrong and gave me no option’s. I then realized after reading I needed to unpair the old remote which I did through the app .It took a bit of time but we’ll worth the trouble since the remotes are expensive. Glad for the Internet help watching hulu with my grand daughter! This does not work if u have not used the remote app before as it needs to be paired.